Over the years we have amassed a great number of digital files that are full of private information at both work and at home in our private lives. Portable hard drives have surely made life easier, but if they are lost or stolen it can be a headache for all the parties that had confidential or private data on the storage drive inside. 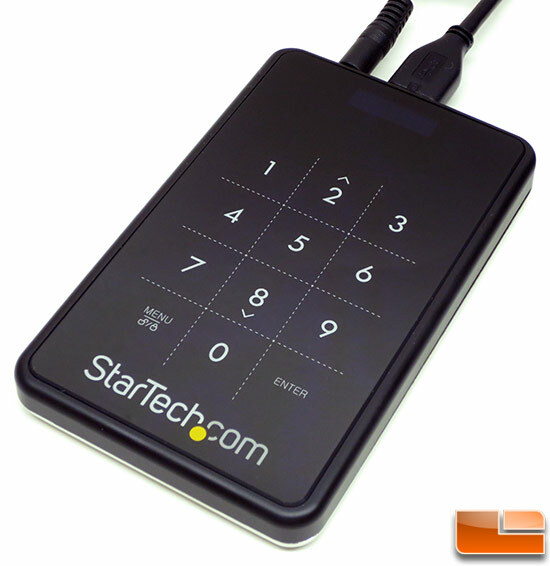 StarTech has developed a USB 3.0 to 2.5-Inch SATA Storage Drive Enclosure that features 256-bit AES hardware encryption to help secure your data on the go. 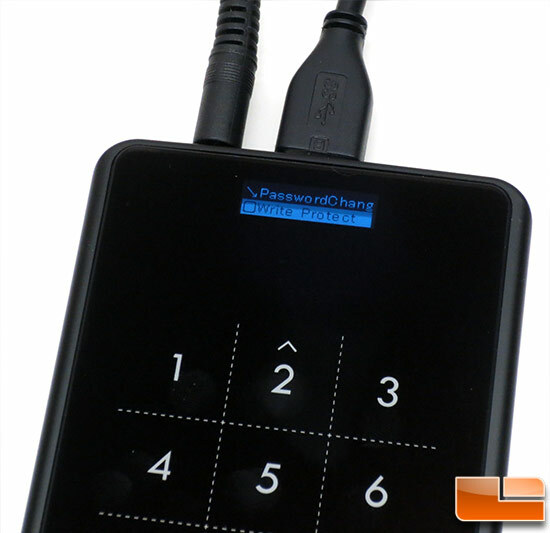 This diskless SATA enclosure runs $79.99 shipped and your data is protected by a 4-8 digit numeric password. If someone takes the hard drive out and tries to connect it directly to a computer they won’t even see your partitions and it will show up as a bare drive. Sound interesting? Let’s take a closer look at what you get with this product and how it performs! 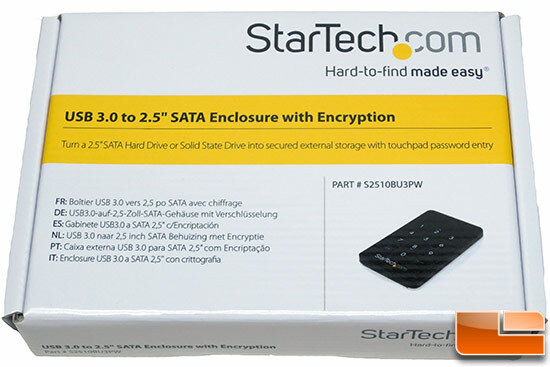 The StarTech USB 3.0 to 2.5″ SATA Enclosure with Encryption is sold under part number S2510BU3PW and comes in a small cardboard box that gives you just the basics of what the product is. This enclosure works without the need of any software, so as long as you are using a PC that has a USB port available you should be in luck. 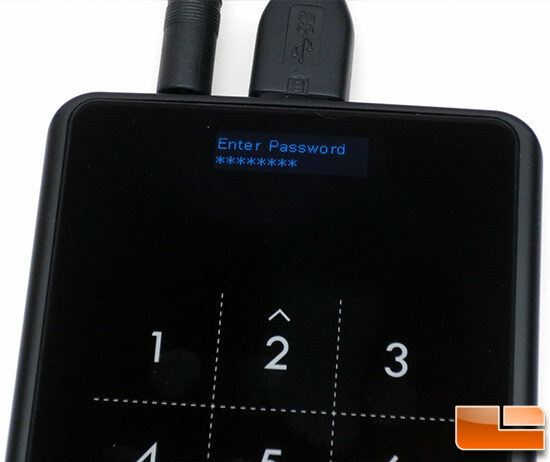 It doesn’t need any software as the 256-bit AES hardware encryption is being done in the portable enclosure thanks to a 32-bit ARM controller that handles the encryption. Inside the box you’ll find the 2.5in SATA Enclosure, USB 3.0 Cable, USB to DC Adapter Cable, Carrying Pouch, Cleaning Cloth, Screwdriver, Screw Kit and an Instruction Manual. Everything that you’d need is included with the exception of the hard drive or solid-state drive that you will be using for data storage. 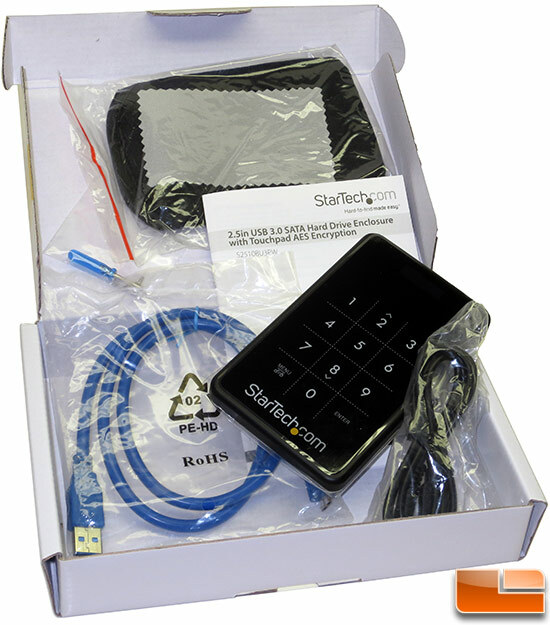 The StarTech S2510BU3PW measures in at 123mm x 77mm x 14mm and weighs 94g without a storage drive. The top portion of the housing is made from plastic and the lower half is made from steel. On top of the unit you’ll find an integrated numeric touch pad and above that you’ll find a small OLED display. The touch pad is very simple to use as have a menu button, enter button, the numbers 0-9 and finally up and down arrow keys that work when you are in the menu mode. 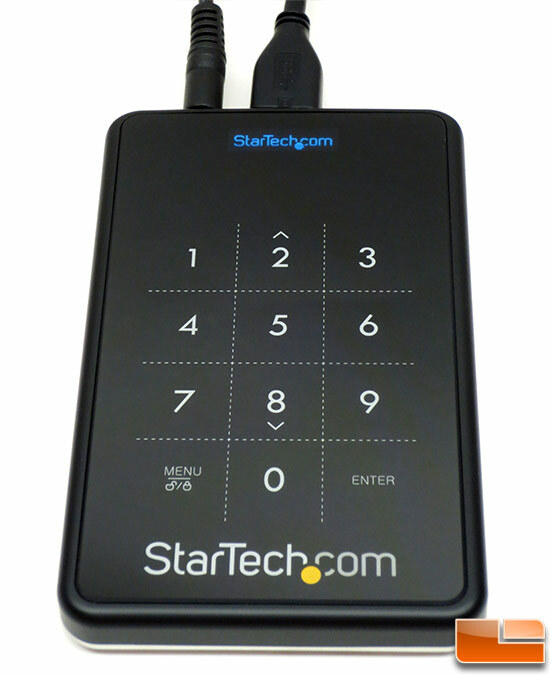 The back of the StarTech S2510BU3PW is chrome that shows finger prints and scratches very easy. We managed to scratch ours in our light box, so expect it to get smeared and scratched up the first time you use it. StarTech included the cleaning cloth for a reason! The back cover is held on by two screws and StarTech provided two additional screws in the event that get lost over time. 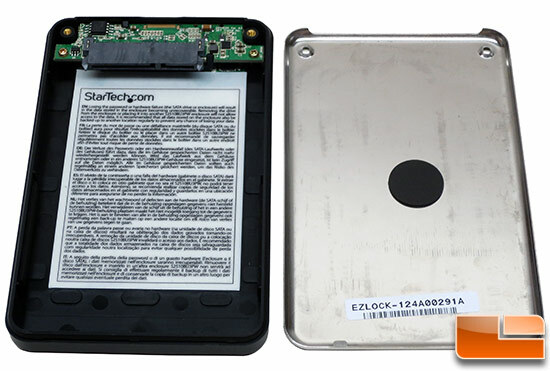 Inside the StarTech 2.5″ Encrypted Hard Drive Enclosure (S2510BU3PW) you’ll see the tiny printed circuit board (PCB) that handles the encryption and converting the SATA drive over to the SuperSpeed USB 3.0 header. The large sticker inside the enclosure states that if you lose the password or if there is a hardware failure (storage drive or enclosure) that the data stored on the drive will become unrecoverable. It also states that you should backup your data regularly to another location to prevent any change of losing your data. You should always keep your portable data backed up on the cloud or on a home NAS, but not everyone does. When you are dealing with encryption it is a must though. 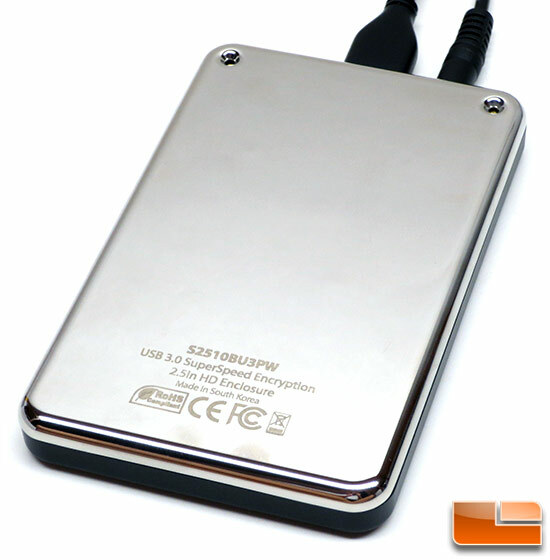 The StarTech 2.5″ Encrypted Hard Drive Enclosure works with 2.5″ SATA HDD’s and SSD’s that have a z-height of 9.5mm or less and those that are under 1TB in capacity. Since this enclosure features USB 3.0 and is ideal for those that like fast data transfer speeds, we used a Crucial m4 256GB SSD with firmware 040H for testing. The storage drive just slides in and is held down by rubber pads on all four sides. With the storage drive inside the unit we turned it on for the very first time and were able to see the OLED display for the very first time. The OLED display is super tiny, but it’s OLED (You are supposed to be impressed here)! 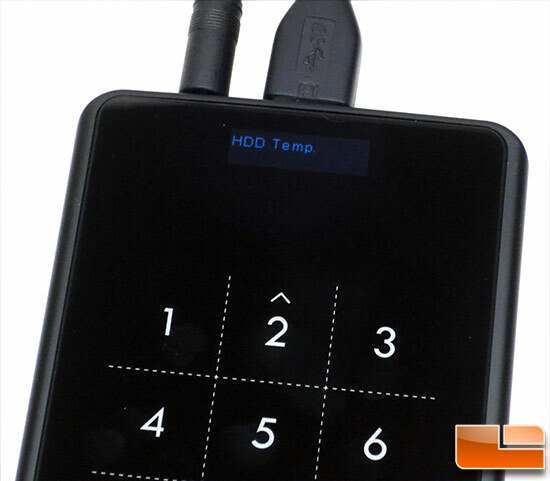 The enclosure knows that a new drive has been installed and it guides you through the process of enabling its encryption function using its OLED display and the touch pad. The password needs to be between 4 to 8 digits, and must be keyed in a second time for confirmation. The encryption process formats the drive, so all the data on the drive will be erased. The process of installing a new drive and initializing the 256-bit AES hardware was painless and took just a couple minutes on our Crucial m4 256GB SSD. Once you have encrypted the drive you can use the menu button to display the storage drive temperature, usage time, change passwords or to enable write protection. there is also a way to enter in a contact number that flashes briefly on each unsuccessful authentication attempt. The ‘HDD Temp.’ feature did not work on our SSD, but all the other functions worked fine. Here is a quick look at some of the other menus. Here you can see the menu to change your password and the box for enabling write protection. It should also be noted that with most drives both USB cables do not need to be used. We used both for testing, but we later found that the SSD was getting more than enough power from the USB 3.0 cable and did not need the additional power from the USB 2.0 power cable. Now that we know what the StarTech enclosure does, what it comes with and how you set it up we can take a look at how it performs!